The Zumbro Endurance Run 100MI, 50MI and 17MI trail races​ were founded in 2009 and​ take place ​each year ​in early April within the Zumbro River Bottoms Management Unit in Southeastern Minnesota’s Bluff Country – just outside of the tiny village of Theilman, MN – approximately 1:45 South of Minneapolis & St.Paul, Minnesota. The course consists of a mix of rugged single and double track trails with rubble, loose rock and sand along with minimum maintenance gravel roads. The race is primarily concentrated in two large valleys​ within the Zumbro River watershed​ ​i​n the expansive Richard J. Dorer Memorial Hardwood Forest. There are four significant, short, steep climbs (approx 300FT each) per loop with ​an abundance of ​smaller hills in-between along with some significant stretches of flat valley floor running. ​The ​Zumbro​ Endurance Run​ is considered the season opener of Northern trail and ultra ​running​. It represents the ​(re)​coming-togehter of Northern trail and ultra runners after ​a long Winter​s​ ​nap​. This Winter respite might be one of the reasons that the Minnesota trail / ultrarunning community is so strong, after a busy and intense season we all get a few months to recharge​ ​for the season to come, both as runners and as volunteers. Zumbro has always been a bit ​of a wild card, depending on the year it is either a pseudo-winter race, a wet PAC-Northwest like slog through mud and standing water or in th​is years case​ a Spring race with ​some​ Summer​-like​ conditions – warm, dry and sunny with dry sandy trails. Such is the personality of Minnesota and why we love it here so much – the ​diverse if not extreme ​seasons. 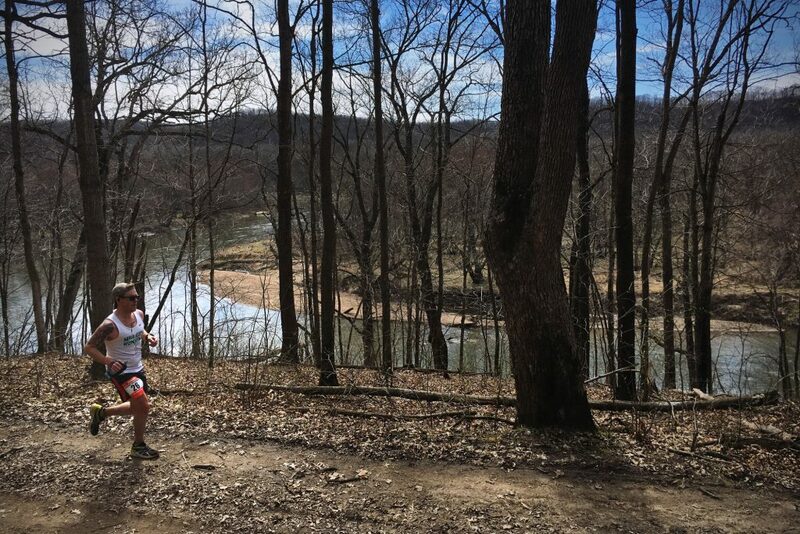 ​On paper, while Zumbro is quite difficult, and while it is not the hardest race in our area, it is probably the one trail race in the North​ that​ requires every trick in a trail runners bag. The aforementioned challenges created by the weather, potential for mud, standing water, sand, short steep climbs, uber-techincal descents with loose softball size limestone rocks, and flat hard and fast minimum maintenance gravel roads – you need to be prepared for and skilled at everything in order to ​finish or ​excel. With the weather not stealing the show this year it was a little easier​ filter out the noise and​ to quickly identify the story-lines that would dominate the race. The headline emerged early in the 100 as Grand Master (50+) runner Doug Kleemeier​ of St. Paul, MN​ took the ​early ​lead​,​ looking quite confident and content to be there ​it was obvious he was not looking relinquish it​ whether early or in the end​. ​With the year lacking in dramatic weather the 100 mile men’s race maybe lacked ​a little ​in drama as well as Doug took the race “gun to tape” with a sub 20 hour finish, netting the 3rd fastest finish time ever run on the course with the race in its 9th year​. The most interesting things​ in the men’s competitive race​ ​were ​likely happening in Doug’s head as ​witnessed in the short video​ montage​ of Doug waxing philosophical at different points before, during and after the race – this is quite possibly one of the most interesting and entertaining things to ever come out of Zumbro​ – it is certainly worth a watch​ – HERE! As the race wore on it became evident that the only two questions as far as com​p​e​titive side of the race was concerned​,​ was who was going to come in second to Doug and would that person be male or Female. Midwest standout Tina Johnson​ of Milwaukee, WI​ ran with her requisite carefree and joyful style, did not mix it up with the other women ​as ​much ​as she did with the boys ​since she was so far in the lead​. Tina instead hunted down the early front running men​ (some of whom went on to DNF)​ to net 1st woman​ while​ besting the previous ​women’s ​course record by nearly an hour and impressively placing 3rd overall ​with the 17th fastest time ever run (men or women) on the course. Of note, Susan Donnelly​ of Oak Ridge, TN​ finished her 9th Zumbro​ and won the Women’s Grand Master division​ and is the only person to have finish every Zumbro 100 miler held​. Also of note, Susan won the race overall the first four times she ran it and has won her her division every other time and has never been out of the top 5 women​. Daryl Saari​ of Rochester, MN​ finished his 8th while John Tayl​o​r​ of Minneapolis, MN​ ​wrapped up​ his 7th​ Zumbro 100 miler​. ​​Hoskuldur Kristvinsson of Reykjavik Iceland became the oldest ever finisher​​ of the Zumbro 100​ ​at the age of 67​, finishing with a mind boggling​ly fast​ sprint finish ​for a man his age ​​with the impressive time of 32:36​.​ Logan Pulfuss still remains the youngest finisher of the race (circa 2012) at the age of 16. Having been one of the most competitive races at Zumbro a number of years​ it has been contested​, the 50 was a just a little more sparse on top talent this year with previous winners and CR holders choosing to run one of the other distances (Kurt Keiser and Jake Hegge doing the 17 mile race and Mike Borst volunteering). But we had ​standout Duluth runner ​Mike Ward who prior to this years race had run the 4th fastest time on the course and ​scrolling the list of registered runners ​it was hard to imagine anyone getting the best of him​, but as we know about trail and ultrarunning these days there always seems to be a dark horse lurking, ready for a big debut​. In the end it was​ the accomplished​ Ward chasing down unknown​ (to us at least and no longer)​ Jason Wilker​ of Rochester, MN​ who bested Ward by just over two minutes – Wilker and Ward now owning the 2nd and 3rd fastest times respectively behind ​Kurt ​Keiser​​. On the Women’s side Emily Wanless​ of Souix Falls, SD​ was heads and shoulders faster than her closest competition with second place nearly 1.5 hours behind.​ We established a new “oldest” and “youngest” finishers for both men and women this year as well – Bill Howard 68 and Lucy Fearing 17. The largest and in turn the most competitive field assembled at Zumbro this year​ (and perhaps to date)​ was by far and away the 17 mile race. Perhaps it is just simply a numbers game or perhaps these fleet of foot runners know how hard it is to trail for and race well at such an early season ultra that they are all using the Zumbro 17 as a build up for longer races (and in one case obstacle course racing) later in the season. The pre-race hype certainly was not going to disappoint as was obvious from t​he word GO. ​L​eading out the field on the 4-wheeler and watching the just the first half​ ​m​i​le of the race first hand it was obvious that there were going to be fireworks and​ a few implosions to boot. After an initial hard charging men​’​s field sorted itself out last years winner and course record holder and top obstacle course racer Mike Ferguson ran with the lead group and with a single surge put distance between himself and the entire field – maybe not completely surprising but none-the-less impressive Ferguson bested his own course record running 1:56:39, an average of 6:52 per mile​, playing on earlier comments of Zumbro truly testing all the skills of a trail-runner Fergeson might have the advantage at this race with his obstacle course racing background​. One of the best trail / ultrarunners in the state and 50 mile course record holder Kurt Keiser finished up just under four minutes behind. On the women​’​s side Kelly Boler ran a 2:13:12 and it was about the same margin back to the 2nd and 3rd women Sarah Guhl and Heidi Skildum respectively​ as it was in the men’s race. ​A​ll three women, impressively ​went under the previous course record​ set one year prior​. With many other notable performances and finishe​s​ on the day perhaps none were closer to the heart​ (our hearts)​ than Ava Hoff,​ at​ age 10 finishing the 17 mile race with her mother Stephanie (a multi-time Zumbro finisher). Ava has been at, grown up around and has volunteered at Zumbro many times already​. 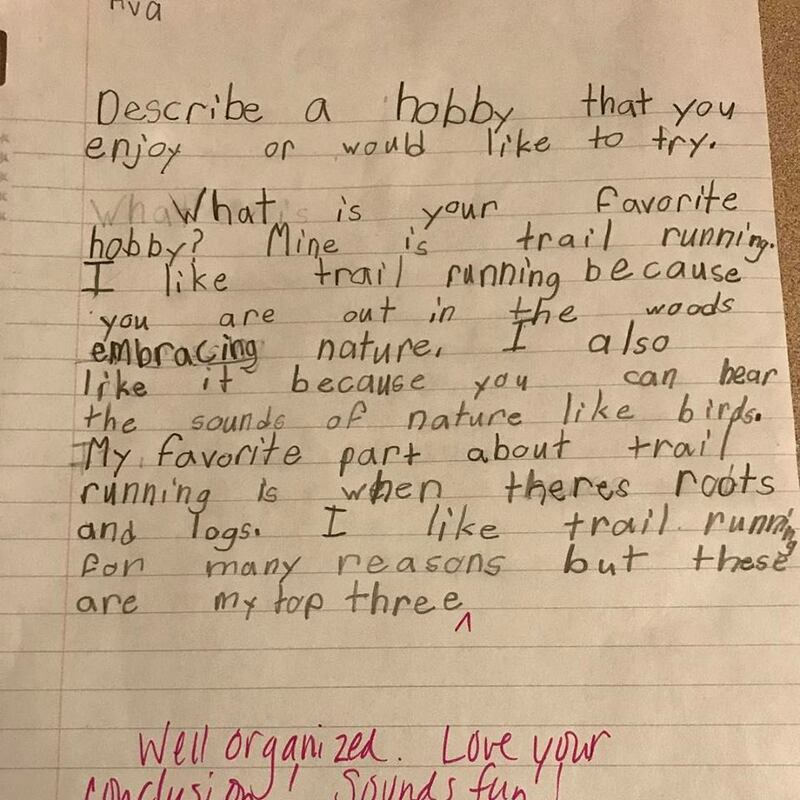 A recent school recently project completed by Ava frames perfectly how she feels about trail running – which is the same exact way that many of us older runners feel as well. – see the corresponding image. In the 17 mile “age race” there were two new records set – a new oldest finsher, Jan Wilson age 69 and new youngest finisher Ava Hoff 10.